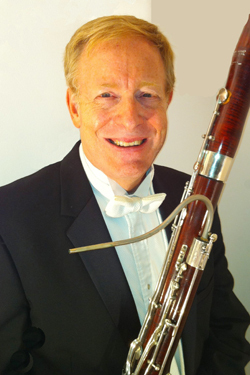 New Jersey Symphony Orchestra Principal Bassoonist ROBERT WAGNER has been a member of the Orchestra since 1979. He has performed as a soloist with the NJSO in bassoon concertos by Mozart, Weber and Vivaldi, as well as the Duo Concertino of Richard Strauss. He has toured extensively and recorded with the Orpheus Chamber Orchestra, and he has performed as a member of the Boehm Quintette and American Wind Quintet. Wagner graduated with both his Bachelor and Master of Music degrees from The Juilliard School. He teaches at Princeton University and serves on the boards of the League of American Orchestras and ArtPride New Jersey. He also teaches privately. How long have you been with the NJSO? I started playing during the 1978–79 season, and I won the job in spring of 1979. Between addressing the audience on stage and standing in the lobby during intermission, your voice is one of the most prominent that patrons hear. What do you talk to them about? When I was a fourth grader in Teaneck, I played the flute. At the end of fourth grade, my family moved to California. My new elementary school didn’t have woodwinds, so I switched to piano. In middle school, I wanted to play the flute again ... me and about 20 other kids. My teacher looked at me and said, “You’re big kid—you can play the bassoon.” And I had a great affinity for it. How people are experiencing the music is the most common subject, because there are all kinds of possibilities as to how art affects people. We talk about how people are hearing it and memories that are attached to it, both for the most familiar pieces and the new ones. And if I’m holding my instrument, people are sometimes surprised at how complex it is. Patrons are very complimentary. It has amazed me throughout my career that they always think our latest music director has made us sound the best, even though the musicians have largely stayed the same. We always develop a partnership with our current director. What do you do when you’re not playing? I spend a lot of time working across the industry with the League of American Orchestras. I’ve conducted seminars with other orchestras and taught classes at Manhattan School of Music and at Eastman; I talk about industry and musicians’ roles in it. Most of my life is consumed with making reeds for my bassoon—it’s sort of a necessary hobby. I walk a lot with my iPod, and I’ll watch the Yankees ... anything to do while making reeds. I’m listening to some of the NJSO’s upcoming repertoire, and I’ve got some Pink Martini. I’ve really gotten into the (Mac program) Garage Band scene—there are some really interesting young composers there. I’m having fun with what’s on the Internet right now. Some of my favorite podcasts are NPR’s “Story of the Day” and “Wait, Wait Don’t Tell Me.” “The Bowery Boys” is a New York City history podcast; it looks at the history of different buildings and neighborhoods. What makes you a Mac instead of a PC? It’s just better. Friends who have been Mac people have told me that for a long time, and I really grew into it.